Singapore Excited About Rahman´s Marina Bay Jai Ho Concert! Singapore & Especially Little India Excited About Rahman´s Marina Bay Jai Ho Concert! It is by now well known that last year's Oscar and Grammy winner, India's pride A.R. Rahman is all set to perform at Singapore's Marina Bay Sands. Just to recall, the A.R. 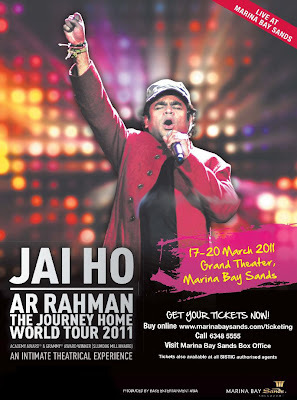 Rahman Jai Ho Concert kicked off in June 2010 in New York and will span 16 major cities worldwide. The next leg will be at Marina Bay Sands' The Grand Theater from the 17th to 20th March. Performances will include songs from 'Slumdog Millionaire' as well as films like 'Lagaan', 'Jaane Tu... Ya Jaane Na', 'Dil Se', 'Rang De Basanti' and 'Roja'. So how does Singapore, and especially the are around the Mustafa Centre/Mall, better known as Little India feel about it? Well, the excitement is quite palpable. In fact, when one of our local contacts talked to people the topic inadvertantly shifted to the Rahman concert repearedly.